Within the TimeMoto PC Software it is possible to view the total hours worked per day. Under [Report] > [Day], you can open the day report. Here you can see an overview of worked hours per day. This report can be exported for use in your payroll system. As long as the clocking sequence is correct, you will see the clocking data and duration per day within your set parameters. If the clocking sequence is incorrect, you will see "Incorrect clocking" in the "Remarks" column. You can correct these clockings under [Edit] > [Clock]. The Day report also shows you the overtime balance of a user under the "Balance" column. Overtime can only be calculated if a work schedule is assigned to the user or if work time has been scheduled, under [Edit] > [Planning]. If there is no work schedule or planned work time, the values under "Duration" and "Balance" will be the same. 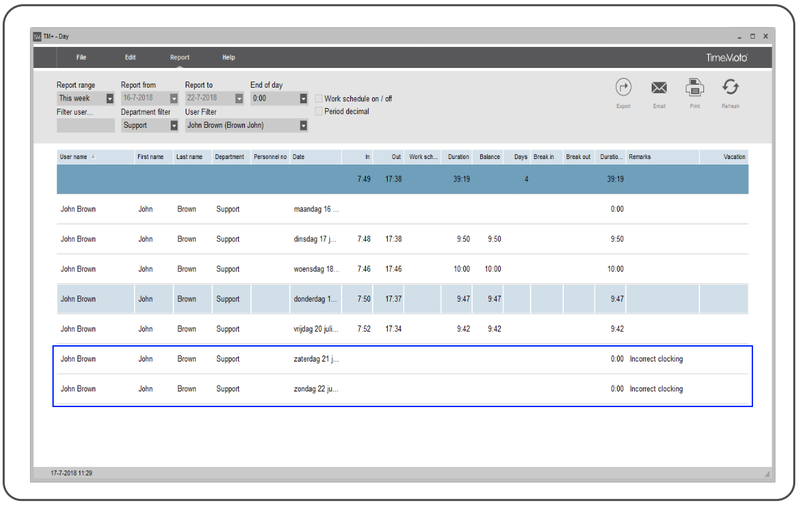 At the top of the day report, you see a summary of all worked hours over the selected period. You can export, print, or send the day report by e-mail.